That was a real final score 30 years ago May 17, 1979. The New York Times featured a lovely article on Sunday recapping a wild game at Wrigley with 18mph winds blowing out. The game featured 11 home runs, 50 hits, and 47 runs scored. Neither starting pitcher made it through the first inning, and the Phillies at one point lead 21-9. Philly.com has some great excerpts from the Phillie's telecast. You can apparently listen to it on mlb.com for a few bucks. 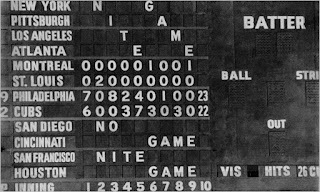 Oddly enough, the only game since 1900 that beats it in terms of total runs scored was on August 25, 1922 when the Cubs beat the Phillies at Wrigley 26-23. That game featured 1 more hit, but only 3 home runs all by the Cubs.